You know what’s the most annoying thing about an operating system update, especially one like the iOS 7.1 that was released recently that boasts several new features and improvements? Not knowing exactly what has changed. Sure, the change log for the iOS 7.1 listed out the major changes like an automatic HDR mode for iPhone 5S, keyboard and such, but what else? YouTube user, iTwe4ks has compiled all the new changes into a video that shows you everything you need to know about the update. 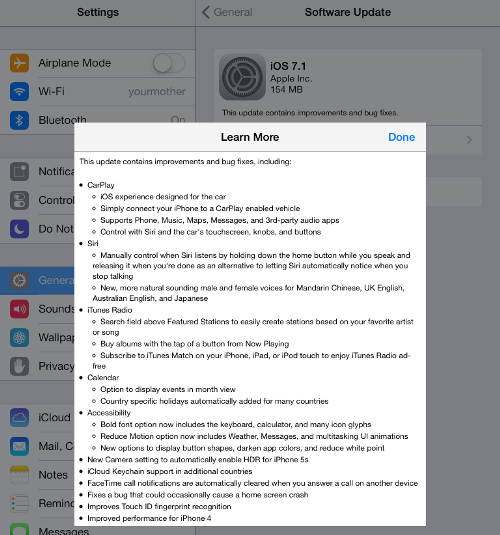 If you haven’t updated your iOS 7 to the latest version yet, I think it’s time to do so because on top of new and improved features, the update also include bug fixes that addresses several issues including that black/white screen of death, improved Touch ID sensor capability, and of course, who could forget, CarPlay support.